Fyffes plc has operations in Europe, the US and Central and South America and its primary activities are the production, distribution and marketing of bananas, pineapples and melons. Freddy Fyffes is the company’s brand on packs of small bananas – specially selected for children and just the right size to fit into a school lunchbox. 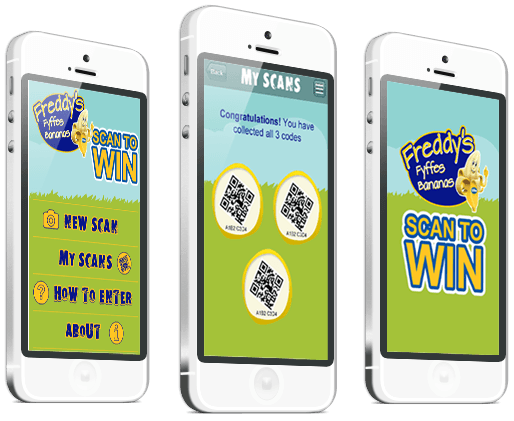 The company wished to provide a digital response mechanism for a sales promotion on Freddy Fyffes bananas where customers could collect 3 on-pack unique codes to win Kids-Go-Free tickets to Dublin Zoo. Unique ‘use-once’ codes are a popular way for CPG companies to ensure promotion entrants have made a purchase. In this case, Instead of printing the unique on-pack codes by text only, Fyffes wished to take things a step further by printing the codes as unique QR codes that could be scanned by smartphones. There was also a requirement to distribute the Zoo ticket prizes digitally – thus removing any need for physical distribution and ensuring a 100% digitally-enabled promotion. Púca delivered an integrated solution for Fyffes, encompassing a branded app (available for both iPhone and Android smartphones) to scan the codes, as well as a web microsite where the codes could be entered manually. Winning Kids-Go-Free tickets were distributed digitally and could be redeemed directly on the Dublin Zoo website. The codes were printed as unique QR codes on stickers that were placed within each packet of Freddy Fyffes bananas. Each code was unique and could only be used once, thus providing a robust proof of purchase mechanic to drive incremental brand sales. Customers used the built-in scanner in the app to scan the codes, check their ‘balance’, and share the promotion with their friends. Customers could also use the microsite which replicated these features (although instead of scanning the codes, they could enter the code manually). A simple Facebook or email registration process for the app and microsite kept track of each customer and meant that customers could choose how they wished to engage with the brand and whether they wanted to share their progress with friends. The campaign saw an unprecedented 97% completion rate (of all unique customers who engaged with the promotion). In addition to detailed download statistics and voucher redemption rates, Fyffes were able to gain unique customer insights on consumption behavior and user demographics.